Staying on top of price movements of various polymers and rubber raw materials is critical, especially if you are an integrated manufacturer and distributor of pipe systems and fittings. ICIS provides a broad coverage of the polymers, plastics and rubber markets, including polyvinyl chloride (PVC), high impact polystyrene (HIPS) and styrene butadiene rubber (SBR). What is the current trading price of commodities like PVC, HIPS and SBR? How will the overall plastics and rubber trading dynamics affect your material inventory, usage and pricing scheme? 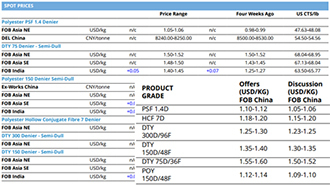 What are the weekly prices of key polymers and rubber? ICIS pricing reports provide regional price assessments of all key polymers traded regionally and globally. They are published daily or weekly, enabling you to keep track of trade prices, understand price drivers/fluctuations and have a reliable benchmark for contract price settlements. 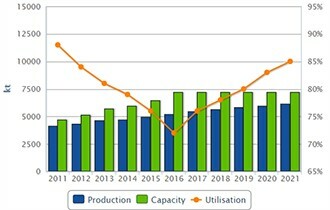 What are the forecast prices for raw materials such as PE and PP in the next 12 months? 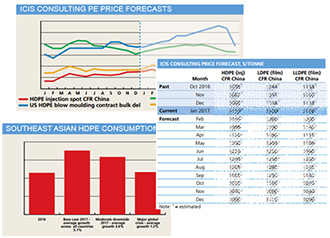 ICIS consultants forecast the likely trade prices of key raw materials in the coming 12 months, based on the supply and demand dynamics and market developments.